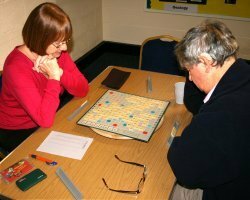 The Scrabble Group meets up twice a month for a quiet, peaceful and relaxing afternoon of playing a well-loved game. Q When you play at home do you always win? A Why not come along and try new challenges. Q When you play at home do you always lose? A Come join us for some practice. New players are very welcome to join this small, friendly group, so just come along.